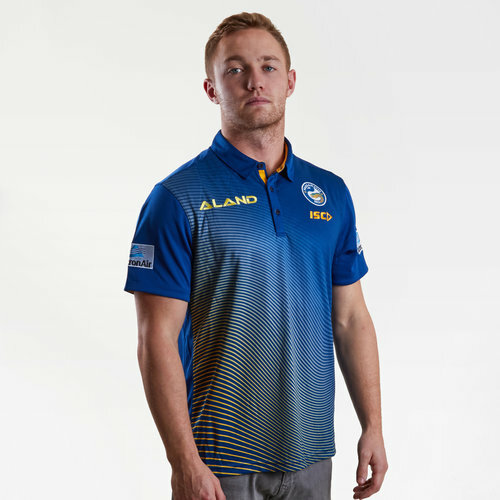 Fly the flag for the Eels when you wear these Parramatta Eels NRL Players Rugby Polo Shirt from ISC. The Parramatta Eels play their rugby in Austalia's premier rugby league competition, the National Rugby League NRL. The club was formed in 1947 and it took thirty years for the club to make the grand final, which they did in 1976 and 1977, losing on both occasions. However, this period foreshadowed their most successful period in the early 1980s, when they won four premierships and qualified for five grand finals in six seasons. This was a golden era for the club and yielded their only premiership titles. In 2016, a salary cap breach saw them stripped of their 2016 Auckland Nines premiership. For the 2018 season, Parramatta were predicted by many before the season to finish in the top 8 and challenge for the premiership. In the final game of the season, Parramatta were defeated 44-10 by the Sydney Roosters ensuring that the club finished last and claimed their 14th wooden spoon. When the proposal for a Parramatta club was put to the NSWRL in 1946, the proposed colours for the new District side were blue and gold. The colours were selected based on the navy, sky blue and gold colours used by Arthur Phillip High School. The colours were also adopted by the Parramatta District Rugby Union club in 1936 and also suggested in Parramatta City Council’s use of livery of blue and golden-orange in their crest. While the colour scheme has remained consistent throughout the history of the club, the shades of blue and gold have changed several times. Sticking with tradition this polo shirt is blue with gold detailing in the form of a wavy design which is more prominent at the bottom of the shirt. This top has a collar and 3 button placket. The ISC logo is on the left of the shirt with the club badge just above it.